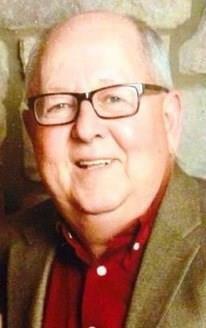 Rex Lanier Grimsley, of Bentonville, Arkansas passed away on August 31, 2016 in a plane crash at the Bentonville Municipal Airport. He was a committed husband, loving father and grandfather, and Christian. A cattle broker, avid quail hunter, and pilot, Grimsley was a lifelong resident of Vaughn, just west of Bentonville. He frequently made trips to Texas in his Beech A36 Bonanza to entertain family and friends on bird hunting trips. He spent the evening preceding his death with his family celebrating his grandson's birthday. He died the following morning piloting his aircraft after evading an incoming aircraft at the local airport. Grimsley graduated from the University of Arkansas with a Business degree in 1968, following which he taught distributive education classes in Pine Bluff and later at Bentonville High School. He later attended the U of A and obtained a Masters of Business Administration. He was an ardent Razorbacks fan. Grimsley was an entrepreneur at heart and owned several successful businesses throughout his career, including F&G Feed Store, where he was partners first with Bob Fuqua and later with George Huber, and Brookside Seed Company and Bentonville Lube 'N Go, where he was also partners with Huber, and a prosperous cattle broker business. He was a shareholder and director at Grand Savings Bank. He was a longtime cattleman, he grew up on a dairy farm in Bentonville, and began running his own beef cattle in 1970. He maintained many interests in agriculture, primarily in the cattle market and was a fixture at several area cattle auctions. Grimsley raised commercial cattle, registered Charolais, and registered Brangus in the Bentonville area and also at Arkoma Land and Cattle Company in Delaware County, Oklahoma. He was joined in the cattle operation by his son, Paul, who will continue to carry on the family tradition. Grimsley valued work ethic and was known for his entrepreneurship and love for deal making. He loved finance and greatly enjoyed his participation with First National Bank (formerly Citizens Bank) in Bentonville, and later with Grand Savings Bank. His keen mind, quick wit and love of fun made him good company. He was a well-known prankster. Grimsley was a friend to many and enjoyed entertaining family and friends at his Rooster Ridge hunting lodge and had a great affection for his hunting dogs and household pets. He adored his grandchildren. He was a longstanding church member at First Christian Church (Disciples of Christ). He will be fondly remembered and missed dearly. 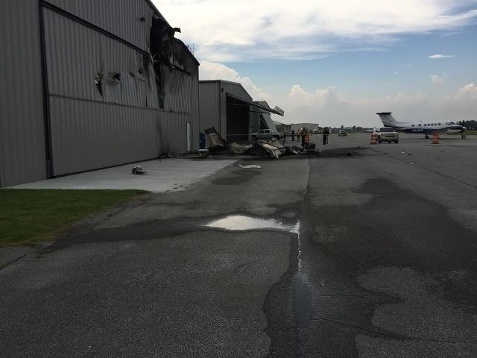 On August 31, 2016, about 0930 central daylight time, a Beech A36, N8283D, was destroyed when it impacted a hangar during an attempted takeoff from runway 18 at the Bentonville Municipal Airport (VBT), Bentonville, Arkansas. 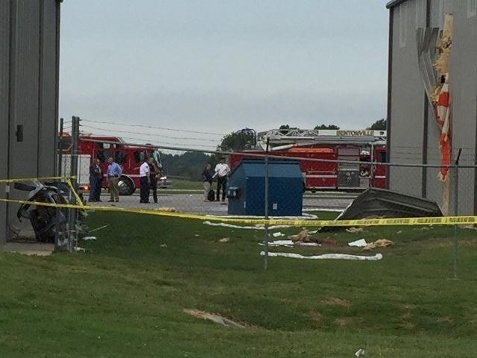 The pilot, who was the sole occupant of the airplane, was fatally injured. The airplane was destroyed by impact forces and a postimpact explosion and fire. The airplane was registered to and operated by the pilot under the provisions of Title 14 Code of Federal Regulations Part 91 as a personal flight. Visual meteorological conditions prevailed for the flight, which was not on a flight plan. The flight was originating at the time of the accident and was destined for the Springdale Municipal Airport (ASG), Springdale, Arkansas. The pilot of another airplane reported that, while approaching VBT, the flight was authorized by approach control to change to the VBT common traffic advisory frequency (CTAF). He stated that, after the frequency change, he transmitted his intent to land on runway 36 over the CTAF. The pilot stated that the approach controller advised him that no traffic was observed at VBT, and the pilot heard no radio transmissions from other aircraft during the landing approach. After landing on the first 1/3 of runway 36, he noted another airplane (the accident airplane) at the end of runway 18 initiating a takeoff. The pilot transmitted over the CTAF that he was on the runway, but the accident airplane continued the takeoff. 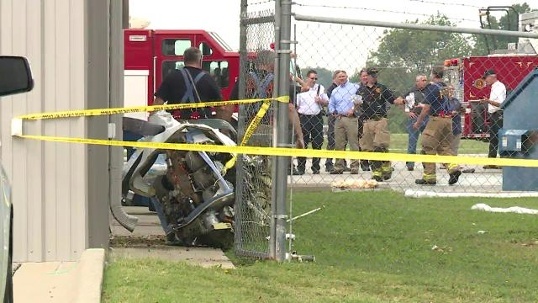 Shortly thereafter, the accident airplane "appeared to add more power and [rolled] left over the grass." 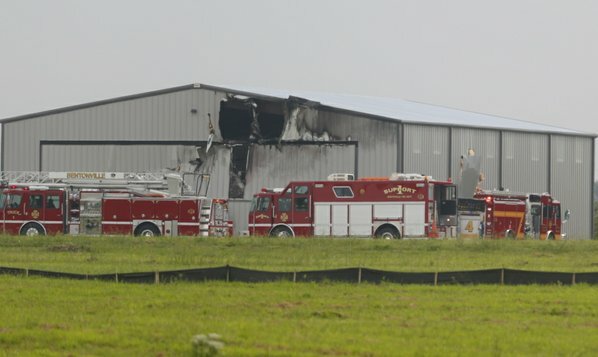 The accident airplane became airborne, pitched nose-up then nose-down twice before rolling left and impacting a hangar. Surveillance video from VBT showed the other airplane during its landing roll on runway 36. The accident airplane could be seen taking off from runway 18 when it abruptly veered to the left (east). The accident airplane crossed the un-paved ground between the runway and the airport ramp, became airborne, and traveled out of the frame of the video. 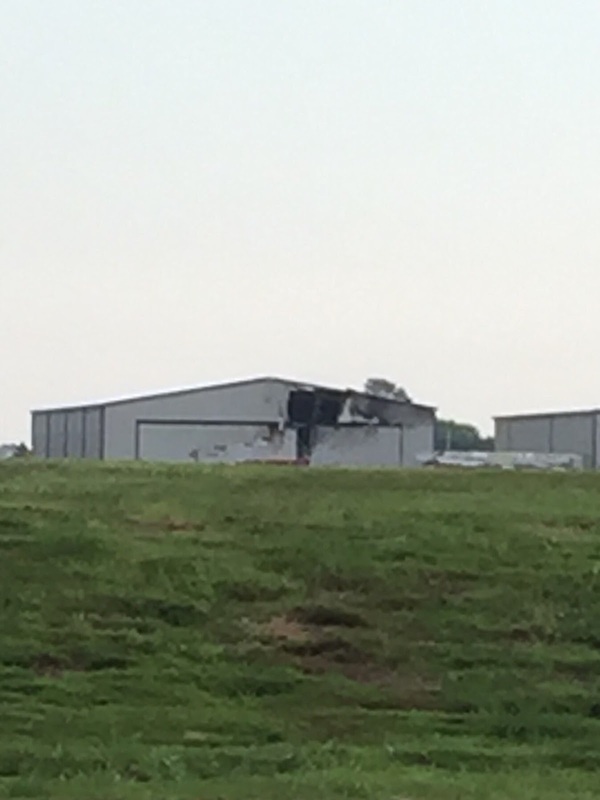 The footage did not capture the impact with the hangar but did show the explosion of impact and a postcrash fire. The 70-year-old pilot held a private pilot certificate with airplane single-engine and multiengine land ratings. His most recent Federal Aviation Administration (FAA) third-class medical certificate was issued on March 11, 2015, with a limitation for corrective lenses. 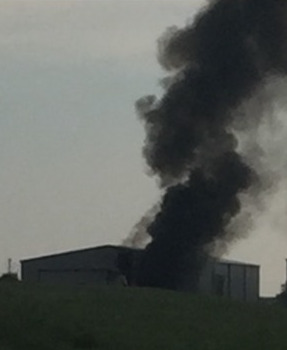 The pilot reported no medical conditions and no use of medications to the FAA. At the time of the medical examination, the pilot reported 1,389 total hours of flight experience. The pilot's flight logbook was not available for review during the investigation. The airplane was a 1993 Beech A36, serial number E-2816. The airplane was a single-engine monoplane with retractable tricycle landing gear and seating for six occupants, including the flight crew. It was constructed predominately of metal and was powered by a Continental IO-550-B (6) engine, serial number 675847, rated to produce 300 horsepower. 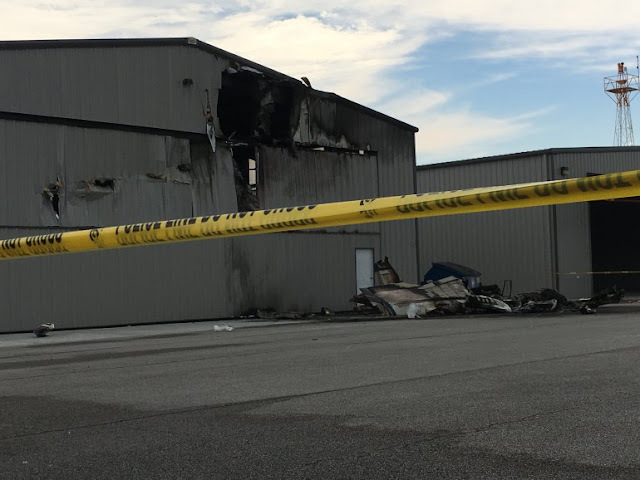 Review of the airplane maintenance records found within the wreckage revealed that the airplane's most recent annual inspection was performed on August 10, 2015. An entry dated March 14, 2016, indicated that the engine had been overhauled and reinstalled. Based on the maintenance entries the airplane had accumulated 1489.5 total hours as of the date of the engine overhaul. At 0935, the weather reporting station located at VBT recorded wind from 020° at 3 knots, 10 miles visibility, clear sky, and an altimeter setting of 30.12 inches of mercury. At the time of the accident, VBT had a single runway (18/36), that was 4,426 ft long and 65 ft wide. The runway had two intersecting taxiways located about midfield, requiring airplanes to back-taxi to reach either end of the runway. 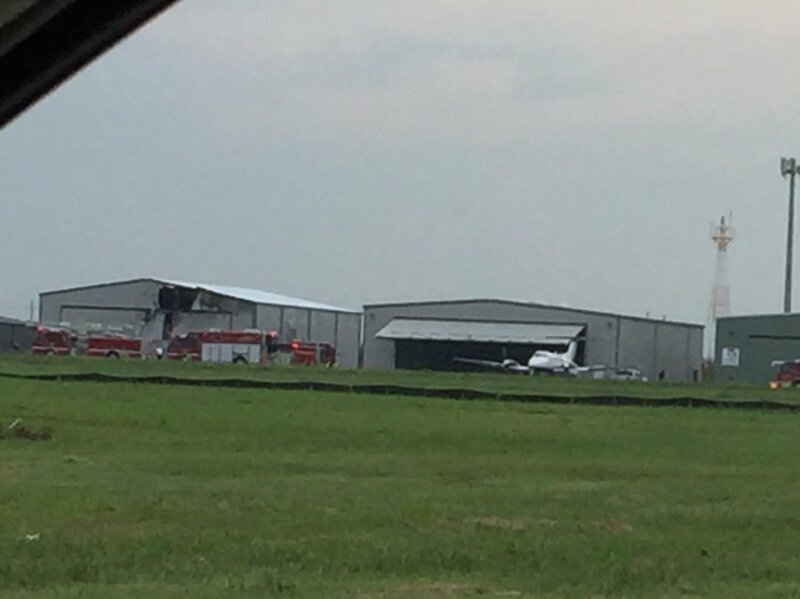 The airplane impacted a hangar located on the east side of the runway. The hangar was about 1,900 ft from the north end of runway 18 and 360 ft east of the runway centerline. A postimpact explosion and fire consumed the cabin section of the fuselage and the inboard wing sections of the airplane. 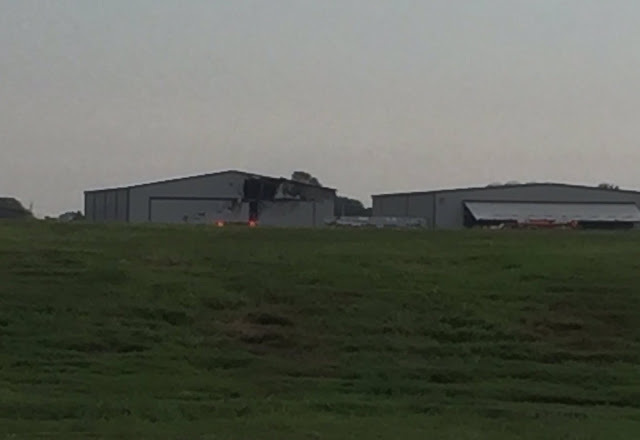 Fire also damaged the hangar. 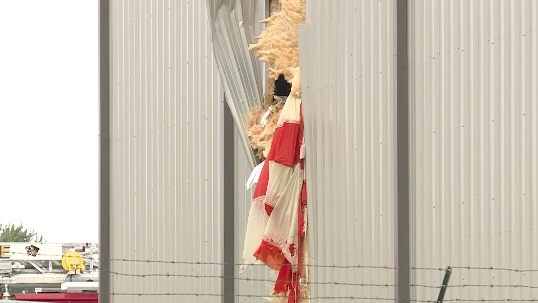 There was a hole in the front of the hangar (west wall) near the peak and another hole in the south wall. 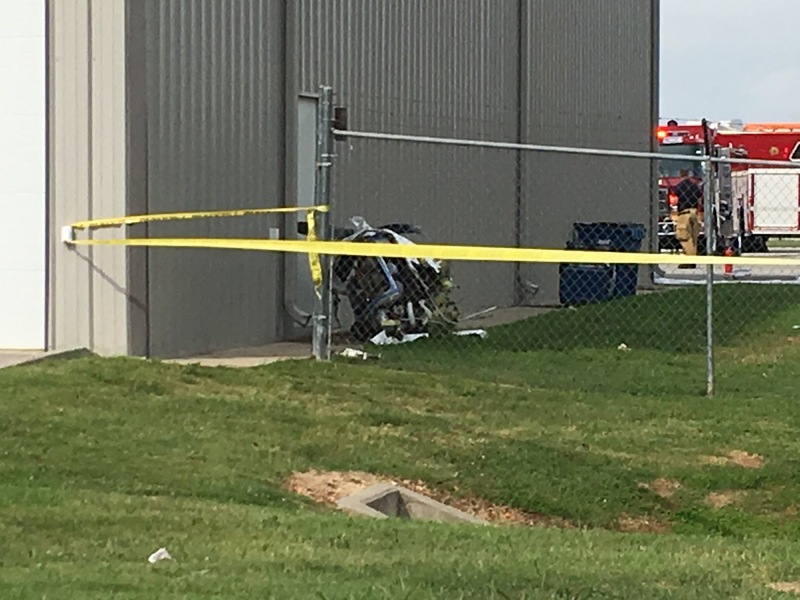 The airplane's engine had separated from the airframe and came to rest next to the north wall of the adjacent hangar. 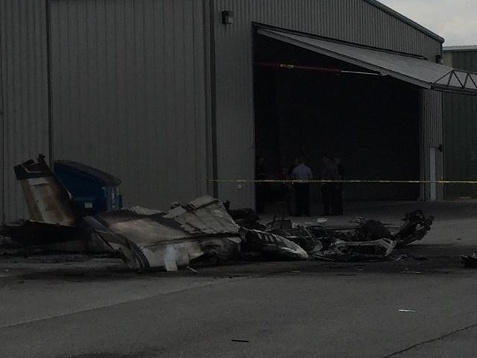 The airframe came to rest in front of the hangar that was struck with the airplane nose facing west. Examination of the airplane at the accident scene confirmed the presence of all control surfaces. Due to the extensive fire damage, a comprehensive examination of the fuselage structure was not possible; however, examination of the components that remained did not reveal any evidence of a preimpact structural failure. Examination of the airplane's control system showed that the left aileron actuation cable was separated in overload near the left wing root, and the left bellcrank ear was separated with the cable still attached. The right aileron actuation cable was continuous from the cockpit area to the right bellcrank, where the ear separated from the bellcrank with the cable still attached. The right rudder cable was separated in overload in the cabin floor area. The left rudder cable was continuous from the rudder to the cockpit floor area. The elevator control cables were continuous from the rear bellcrank to the cockpit floor area. The elevator trim cables were continuous from the tail connections forward to the cabin floor area. The trim tab functioned normally in both directions. All three propeller blades exhibited signatures consistent with the production of power at the time of impact, including bending, twisting, gouging, and scratching. Examination of the airplane's engine revealed compression and suction on all cylinders when rotated by hand. The magnetos remained attached to the engine and spark was produced on all leads during engine rotation. The airplane was equipped with navigation and communication radios, but examination of the airplane's avionics was not possible due to the extensive fire damage. No preimpact anomalies of the airframe, engine or associated systems were found. VBT was an uncontrolled airport and did not have an operating control tower. Pilots could communicate and announce their intentions using CTAF. The CTAF at VBT was not recorded; however, an employee at the fixed base operator on the airport reported that she heard over the CTAF the landing airplane's pilot announce the airplane's position on the landing approach and his intent to land the airplane at VBT. She also reported that she heard the pilot of the landing airplane state, "Bentonville Municipal I am on the runway!" She did not hear any other pilots on the CTAF. 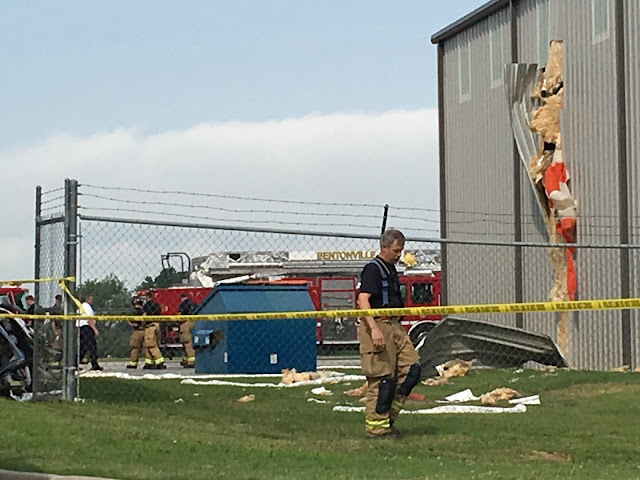 The Arkansas State Crime Laboratory Medical Examiner, Little Rock, Arkansas, conducted an autopsy of the pilot and reported the cause of death as multiple blunt force injuries, and the manner was accident. The autopsy documented the presence of a pacemaker in the chest wall. The FAA Bioaeronautical Sciences Research Laboratory, Oklahoma City, Oklahoma, performed toxicology testing on specimens from the pilot. Testing revealed the blood pressure medications metoprolol and valsartan in the urine and blood. The potentially impairing sedative temazepam was detected in the urine at 7.204 ug/ml and heart blood at 0.071 ug/ml; its metabolite, oxazepam, was detected in the urine at 0.795 ug/ml, but not in the heart blood. Temazepam is a Schedule IV controlled substance of the benzodiazepine class. It is a sedative intended for the short-term treatment of insomnia; common name for it is Restoril. The package information carries warnings including, "…You may still feel drowsy the next day after taking [temazepam]. Do not drive or do other dangerous activities after taking [temazepam] until you feel fully awake." Temazepam's therapeutic range is from about 0.2 to 1.1 ug/ml and its half-life ranges from about 3 to 13 hours in different individuals. Review of the pilot's personal medical records revealed a history of atrial fibrillation treated with the non-impairing anticoagulant rivaroxaban, and the blood pressure/rate control medication metoprolol. The pilot's high blood pressure and elevated cholesterol were treated with the non-impairing medications valsartan, hydrochlorothiazide, and atorvastatin. Furthermore, he had insomnia treated with temazepam. Finally, following his most recent FAA examination, he developed a slow heart rate that was controlled with a pacemaker, which was implanted in February 2016. An examination of the pilot by a physician's assistant 2 weeks before the accident documented that the pilot felt well with no adverse symptoms from medications or his medical conditions. 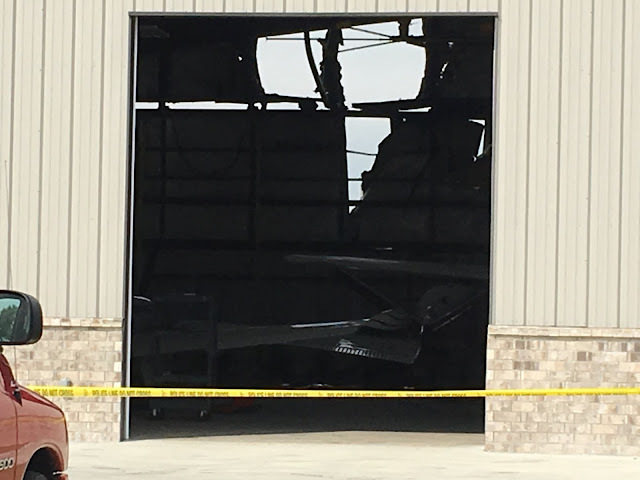 On August 31, 2016, about 0930 central daylight time, a Beech model 36, N8283D, was destroyed when it impacted a hangar during an attempted takeoff from runway 18 at the Bentonville Municipal Airport (VBT), Bentonville, Arkansas. The pilot, who was the sole occupant of the airplane was fatally injured. The airplane was destroyed by impact forces and a postimpact explosion and fire. The aircraft was registered to and operated by the pilot under the provisions of 14 Code of Federal Regulations Part 91 as a personal flight. Visual meteorological conditions prevailed for the flight, which was not on a flight plan. The flight was originating at the time of the accident and was destined for the Springdale Municipal Airport (ASG), Springdale, Arkansas. Surveillance video obtained during the on-scene portion of the investigation showed that the accident airplane was departing on runway 18, when it abruptly veered to the east. Another airplane was visible on the recording and was rolling to the north on the same runway. The other airplane had reportedly just landed on runway 36. After veering to the east, the accident airplane crossed the un-paved ground between the runway and the airport ramp area. The airplane became airborne and travelled out of the frame of the video, however, the explosion and fireball were visible on the recording. There are two surveillance videos of accident, aircraft maintenance records, etc that can be found in the investigation docket items. No one past the age of 55 should be flying a plane.